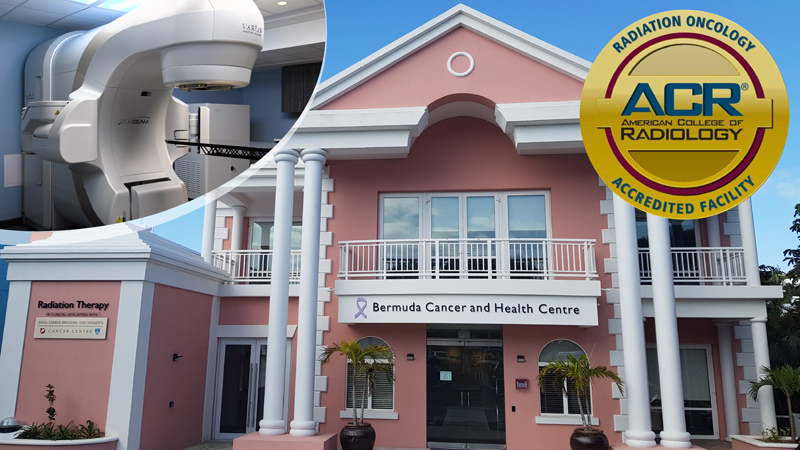 Bermuda Cancer and Health Centre has been awarded accreditation in radiation oncology by the American College of Radiology [ACR], making the local not-for-profit the first international facility to achieve this recognition. ACR accreditation is a voluntary process that demonstrates Bermuda Cancer and Health Centre’s commitment to excellence in patient care and safety. “The Centre provides radiation therapy, in clinical affiliation with Dana-Farber/Brigham and Women’s Cancer Center, and can treat 95% of all cancer where radiation is a recommended treatment course, meaning that the majority of residents no longer have to travel overseas for radiation treatment and pain management. People can be confident that they are receiving world-class treatment right here at home,” a spokesperson said. “This is a tremendous accomplishment for our Centre and is a testament to our commitment to the highest quality of care for our patients,” explains Dr Chris Fosker, Medical Director and Radiation Oncologist at the Bermuda Cancer and Health Centre. The radiation therapy unit, which opened in May 2017, elected to undergo the rigorous ACR process to provide a means of comparing themselves against international best practice standards. “It’s important for patients to know that every aspect of the ACR accreditation process is overseen by board-certified, expert radiation oncologists and medical physicists,” the Centre said. “The ACR seal of accreditation represents the highest level of quality and patient safety. It is awarded only to facilities meeting specific Practice Guidelines and Technical Standards developed by ACR after a peer-review evaluation by board-certified radiation oncologists and medical physicists who are experts in the field. Huge congratulations to Dr. Fosker and his team for all of their hard work in such a short space of time! From building the new facility, to staffing it and now to full on Accreditation is a massive task. As a Compliance Manager myself I am familiar with the work involved to achieve accredition. VERY Well done to all. My father just completed his three weeks of radiation and made many friends and always felt the TLC. He was particularly pleased to get his graduation diploma! Well done and blessings of good health to all.